I think the Sapling would make a pretty neat general for my first (Timmytastic) EDH deck. I don't have a very deep cardpool to build with, but I am willing to spend a bit to make the deck viable. With this deck I'm mostly looking for control-hosers (i.e., recursion, reanimate, retrace), discard, and good, strong, creatures to distribute face-beatings. Please tell me what you think of what I've put in, make suggestions of specific cards, and please make comments about the overall composition/direction of the deck! I really like the idea of abusing retrace, heavily--I think it will play fantastically in EDH (esp. something like Worm Harvest in a deck with over 40 lands). I wonder if it would be worth it to put in less discard/control for more land-searching. What do you think? **I've read that this is banned in the format, but that seems really pointless considering that Wasteland isn't, and that the two are essentially the same power level--how often do you really want to destroy a basic land? Last edited by Dr4z3r on 2008-Sep-12 11:56 pm, edited 16 times in total. Unless your playgroup has rules otherwise you can only run cards in the colour of the highlander, if i understand correctly. Thus the vexing Shusher, and the snake form would be off colour. I'm working on a Sapling deck myself. Maybe its just me, but I'm trying to make mine tribal treefolk where in your list you have few treefolk other than Sapling. Last edited by norbert88 on 2008-Aug-09 9:15 pm, edited 1 time in total. While a tribal treefolk build of a Sapling deck seems interesting enough, I just don't see how it's worth all that to make a treefolk deck without Doran. I just don't see how it's worth all that to make a treefolk deck without Doran. I might do it, but I would want it to be mono green for Dauntless Dourbark. Interesting Jon; I'm building tribal deck too, focusing on shamen instead. Personnaly I've built a deck with Sapling as a general, I'm rather focused on cards such as Living Death, Survival for the Fittest, Zombify and such. Greater Good allows U to dig around 40 cards drawing in a single turn if played well around, and then casting a gigantic Living Death. Magus of the Abyss allows you to target Sapling every turn while opponent gets his creatures decimated. Definately a good card to include. And with Eternal Witness, with sufficient reanimator you can get multiple casts of Rude Awakening. Witness also allows you to recover Living Death just after having cast it, then you sacrifice all your board to Greater Good and discard all the creatures you draw, and go again for a 40 creatures Living Death, most of them with CIP effects. I agree with Dr4z3r about the fact that building a treefolk deck without Doran is really underpowered. That being said, it shouldn't be totally bad either. A friend of mine has a mono-green EDH with Azusa, Lost but Seeking as general, and basically just exploits having a LOT of forests with Dourbark, Molimo, Howl of the Nightpack, etc. Thanks for the suggestions, I'll definitely need to get a Magus of the Abyss! Is there any benefit to using a bunch of high-toughness creatures to try and gain life out of the whole thing? 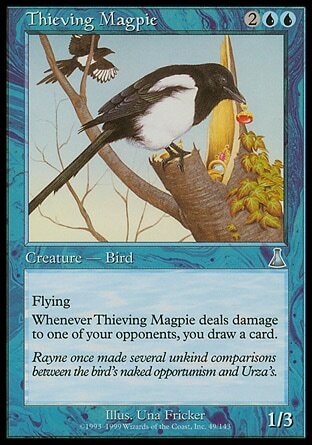 Or would it reduce the power level of the deck as whole having to limit yourself too much with lousy creatures? From the looks of it, most people have just assumed the life gain/loss would be negligable, but I'm curious if anyone has taken it into consideration. I can only think of a couple of cards that are relatively playable in green and black with significantly higher toughness. I think Wall of Roots and/or Vine Trellis may be worth considering, and Silklash Spider should probably go in, but beyond that I would speculate that you're better off just not worrying about your life total. What else would you add? Fendeep Summoner? Woodwraith Corrupter? Normally I love Seedborn Muse, but it doesn't seem to do much in a mostly sorcery-speed deck. I stuck a little wall package in mine as early defense and for synergy with Gravepact. Blossoms, Mulch, Blood, Roots, Cemetary Gate. And changelings. If you have mulch and blossom out with volrath's stronghold, you can wreak havoc on a board and draw a bunch of cards to boot. Savra, Doomgape, and Attrition also make it in, as well as some features like victimize and primal growth. Add in a little token theme with bitterblossom, creakwood liege, worm harvest and night soil and you're good to go. I've done a lot with it since I posted that decklist (I tried it update it last night, but apparently never hit submit ><), including trying Doomgape, Savra, and Attrition, but the sacrifice theme didn't really seem to take me very far. I really felt like a discard theme (hippy, raven's crime, nath) could do a lot better. Attrition is sure sticking around, though Doomgape and Savra are on the chopping block. Woodlurker Mimic seems very subpar in general. Spirit of the Night is a great creature for any deck with black, especially if you can cheat it into play. Grindstone is one of the cards with a question mark, and unless you plan on running Painter's Servant, I wouldn't bother. Feldon's Cane was another card you thought was questionable. I like the effect and have always been a big fan, but I'd run Thran Foundry instead. It can either be a cane for you, or essentially another crypt if your opponent is trying reanimate shenanigans. Other than that, I don't have a lot to say as I'm new to the format myself. I've finally revised the decklist to reflect what I've actually put together. There are still several things I need, but I've taken a lot of the above comments into account, and I think it's looking a lot more powerful! Spirit of the Night sure seems attractively buff, but I'm not running a lot of ways to cheat it into play. Do you think it's worth putting in if I'm not running many ways to cheat it out? In any meta I've ever encountered, a Sapling with Gift of the Deity is not going to remain under your control for long. The deck would greatly benefit from both Lightning Greaves and Brooding Saurian. One thing I've wanted to add to a Sapling Deck is Dead-Iron Sledge. Sure, it's just a weaker Gift of the Deity, but it is really cheap to play and equip. You could also add Tempting Licid to make a full Gift of the Deity, if drawing the one copy doesn't happen often enough to satisfy you.